The Beagle 2 was a British Mars lander that was transported by the European Space Agency's 2003 Mars Express mission. It was a failed astrobiology mission that would have looked for past life on the shallow surface of Mars. The Beagle 2's fate remained a mystery until January 2015 when it was located intact on the surface of Mars in a series of images from NASA's Mars Reconnaissance Orbiter HiRISE camera. The images suggest that two of the spacecraft's four solar panels failed to deploy, blocking the spacecraft's communications antenna. The budget was secret at that time but has been estimated to be between 30 and 50 million pounds, which at then current exchange rates would be about 43-71 million euros or 54-89 million USD. New Scientist magazine reported a budget of 40 million pounds for Beagle 2, and another outlet said 50 million pounds. However, some of the work is known to have been donated or done at-cost. Beagle 2 has a robotic arm known as the Payload Adjustable Workbench (PAW), designed to be extended after landing. The arm is 109 cm long when fully extended, and it can reach about 70 cm to the nearest rocks. The PAW contains a pair of stereo cameras, a microscope (with a 6 micrometre resolution), a Mössbauer spectrometer, an X-ray spectrometer, a drill for collecting rock samples and a spot lamp. Rock samples were to be passed by the PAW into a mass spectrometer and gas chromatograph in the body of the lander - the GAP (Gas Analysis Package), to measure the relative proportions of different isotopes of carbon and methane. Since carbon is thought to be the basis of all life, these readings could have revealed whether the samples contained the remnants of living organisms. Atmospheric methane is another signature of existing life, although geological processes can also be a source. The lander has the shape of a shallow bowl with a diameter of 1 m and a depth of 0.25 m. The cover of the lander is hinged and folded open to reveal the interior of the craft which holds a UHF antenna, the 0.75 m long robot arm, and the scientific equipment. The main body also contains the battery, telecommunications, electronics, and central processor, heaters, and additional payload items (radiation and oxidation sensors). The lid itself should have unfolded to expose four disk-shaped solar arrays. The lander package has a mass of 69 kg at launch but the actual lander was only 33.2 kg at touchdown. The ground segment was derived from the European Space Agency software kernel known as SCOS2000. In keeping with the low cost theme of the mission, the control software was the first of its type designed on a laptop computer. Beagle 2's landing site was a 174 by 106 km (108 by 66 miles) landing Ellipse within Isidis Planitia basin. 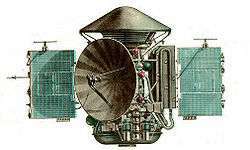 Mars Express launched from Baikonur on 2 June 2003, at 17:45 UTC (18:45 BST). Beagle 2 was a Mars lander initially mounted on the top deck of the Mars Express Orbiter. It was released from the orbiter on a ballistic trajectory towards Mars on 19 December 2003. Beagle 2 coasted for six days after release and entered the Martian atmosphere at about 20,000 km/h, on the morning of 25 December. The lander was protected from the heat of entry by a heat shield coated with NORCOAT, an ablating material made by EADS. Compression of the Martian atmosphere and radiation from the hot gas are estimated to have led to a peak heating rate of around 100 W/cm². After deceleration in the Martian atmosphere, parachutes deployed, and at about 200 m above the surface large airbags inflated around the lander to protect it when it hit the surface. Landing occurred at about 02:45 UT on 25 December 2003 (9:45 p.m. EST 24 December). After analysis of the imagery obtained in 2015, it has been conjectured that after landing, the bags deflated and the top of the lander opened. However these images suggest that at most only two of the four solar panels deployed. A signal was supposed to be sent to Mars Express after landing and another the next (local) morning to confirm that Beagle 2 survived the landing and the first night on Mars. 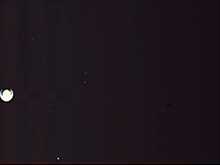 A panoramic image of the landing area was then supposed to be taken using the stereo camera and a pop-up mirror, after which the lander arm would have been released. The lander arm was to dig up samples to be deposited in the various instruments for study, and the "mole" would have been deployed, crawling across the surface to a distance of about 3 metres from the lander and burrowing under rocks to collect soil samples for analysis. The British government spent more than £22 million (US$40 million) on Beagle 2, with the remainder of the total £44 million (US$80 million) coming from the private sector. After it was found, likely intact and with some but not all panels deployed, what happened has been re-evaluated since its 2015 discovery. Because the early phase of mission ran on battery power its possible some data was recorded to memory even if it could not get power from its panels. If so it might be possible to retrieve the data eventually. Also, study of what happened has revealed that Beagle 2 may have gone into its pre-programmed surface operations mode and collected data after landing, it just did not transmit it, or the transmission was blocked by a closed panel. More operations might be possible with some solar arrays deployed, thus it would be able to have more energy then just the battery. ↑ Bell, Edwin (26 August 2014). "Beagle 2". National Space Science Data Center. Retrieved 22 January 2015. 1 2 3 4 Webster, Guy (16 January 2015). 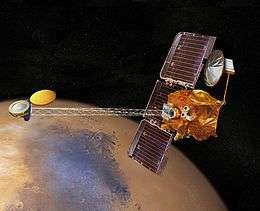 "'Lost' 2003 Mars Lander Found by Mars Reconnaissance Orbiter". NASA. Retrieved 16 January 2015. 1 2 3 "Mars Orbiter Spots Beagle 2, European Lander Missing Since 2003". New York Times. Associated Press. 16 January 2015. Retrieved 17 January 2015. 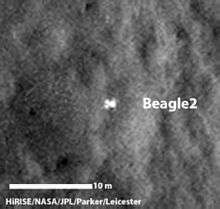 1 2 "UK-led Beagle 2 lander found on Mars". 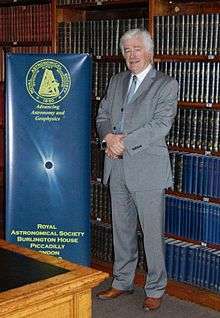 UK Space Agency. 16 January 2015. Retrieved 2016-11-03. 1 2 Sims, M. R. (2004). Beagle 2 Mission Report. Leicester UK: University of Leicester. p. 1. ISBN 1898489351. ↑ McLaren nears Mars. GP Update, 22 December 2003. ↑ The Beagle has Landed! UK National Space Center. January 15, 2015. ↑ Wardell, Jane (24 May 2004). "Beagle Mission Hampered by Funding, Management Problems". Space.com. Associated Press. Archived from the original on 23 May 2009. Retrieved 22 April 2009. ↑ "UK and ESA announce Beagle 2 inquiry". ESA. 11 February 2004. 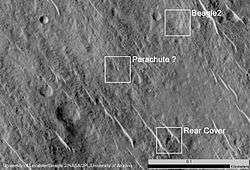 ↑ "Possible evidence found for Beagle 2 location". ESA. 21 December 2005. Retrieved 2009-04-22. ↑ Ghosh, Pallab (20 December 2005). "Beagle 2 probe 'spotted' on Mars". BBC News. Retrieved 22 April 2009. ↑ "Portion of Beagle 2 Landing Ellipse in Isidis Planitia (PSP_002347915)". HiRISE. University of Arizona. 26 January 2007. Retrieved 22 April 2009. 1 2 3 Hogan, Jenny (8 March 2004). "Beagle 2 may have sped to its death". New Scientist. Reed Business Information Ltd. Archived from the original on 18 March 2004. ↑ Bonnefoy, R.; Link, D.; Casani, J.; Vorontsov, V.A. ; Engstrom, F.; Wolf, P.; Jude, R.; Patti, B. & Jones, C. (5 April 2005). "Beagle 2 ESA/UK Commission of Inquiry" (PDF). ESA and UK Ministry of Science and Innovation. Archived from the original (PDF) on 27 March 2009. Retrieved 22 April 2009. ↑ "Beagle 2 Mission Report and Lessons Learned". University of Leicester. 20 August 2004. Retrieved 2016-11-03. 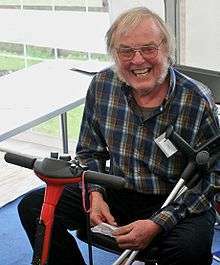 ↑ "Colin Pillinger dies after brain haemorrhage". BBC Online. 8 May 2014. Retrieved 8 May 2014. 1 2 Amos, Jonathan (16 January 2015). "Lost Beagle 2 probe found 'intact' on Mars". BBC. Retrieved 16 January 2015. ↑ Ellison, Doug (16 January 2015). 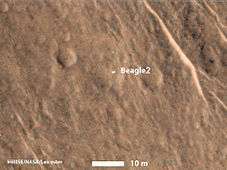 "Beagle 2 location on Mars". Twitter & JPL. Retrieved 19 January 2015. ↑ Grecicius, Tony & Dunbar, Brian (16 January 2015). "Components of Beagle 2 Flight System on Mars". NASA. Retrieved 18 January 2015. ↑ Wall, Mike (April 26, 2016). "Supersharp Mars Photos Show UK's Long-Lost Beagle 2 Lander". Space.com. ↑ Katz, Gregory (16 January 2015). "Missing Mars Lander Found!". Huffington Post. Retrieved 17 January 2015. ↑ Randerson, James (23 September 2007). "New chance for Beagle as Nasa favours mission to the moon". The Guardian. Interactive imagemap of the global topography of Mars, overlain with locations of Mars landers and rovers (Red label = Rover; Blue label = Lander; bold red/blue = currently active). Hover your mouse to see the names of over 25 prominent geographic features, and click to link to them. 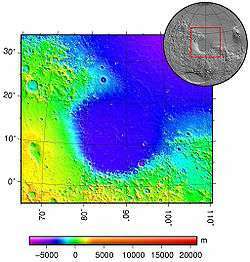 Coloring of the base map indicates relative elevations, based on data from the Mars Orbiter Laser Altimeter on NASA's Mars Global Surveyor. Reds and pinks are higher elevation (+3 km to +8 km); yellow is 0 km; greens and blues are lower elevation (down to −8 km). Whites (>+12 km) and browns (>+8 km) are the highest elevations. Axes are latitude and longitude; Poles are not shown.